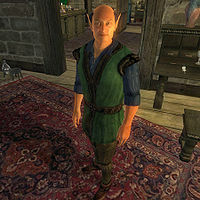 Athragar, a Bosmer nightblade, is an Evoker of the Mages Guild who offers advanced Alteration training and sells spells at the Chorrol Guild Hall. He will spend his entire morning from 6am to midday wandering around the guild building. His afternoon is dedicated to studying and he can be found reading on the ground floor from midday to 4pm and in the second floor library until 6pm. There is also a 33% chance that he will spend time practicing casting a Novice Restore Fatigue spell behind the counter on the ground floor. Starting at 6pm, he will spend four hours wandering around, then retire to his bed in the Living Quarters at 10pm. He is quite atypical in that he is so absorbed by his activities that he always forgets to eat. He will offer his services when not sleeping or reading. He wears middle-class attire consisting of a blue & green outfit and a pair of doeskin shoes. He carries a pair of spare tan linens, his Mages Guild key and a leveled amount of gold. He doesn't wield any weapons, relying instead on a set of medium-high spells from the schools of Illusion and Conjuration, many of which are unique to him. These are the same spells that you can buy off him cheaply since his Mercantile skill is a mere 6. When you meet him for the first time he will politely introduce himself: "A pleasure to make your acquaintance. I'm Athragar of the Mages Guild. How can I serve you?" When asked about the Guild, he will reveal that he is a bit tired of life in Chorrol: "Training and spells, training and spells. It gets so boring after a while; maybe someday I'll be able to move to the Arcane University." If you inquire about Earana during the local recommendation quest, he will offer you some information into her relationship with Teekeeus: "I don't know all the details, but I heard that she complained to the Council until they removed Teekeeus from his position at the Arcane University." On the mythical Fingers of the Mountain he remains skeptical: "I've heard of it, but I don't really know what it is. Something about tapping into the power of the weather. Those Ayleids were pretty crazy." As an advanced trainer, Athragar can provide you with the necessary reference for the Alteration Master Training quest. Once your alteration skill level reaches 70, speak to him and choose the "training" option, which will trigger the quest and this dialogue: "If you wish to learn more about Alteration, you'd be wise to consult Tooth-in-the-Sea. If you can find him, that is. I believe he's currently residing somewhere north of Bravil. Spends most of his time in Niben Bay, I understand. And I do mean IN Niben Bay." Fellow guildsman Angalmo will point you towards Athragar, commenting on his magical abilities: "If you need training, Athragar has a reputation for being very good with Alteration. You might consider speaking to him about it." Alberic Litte also notes on Athragar's ability: "If you're skilled enough, Athragar has a rather powerful frost spell for sale. Very effective, but dangerous to the inexperienced."